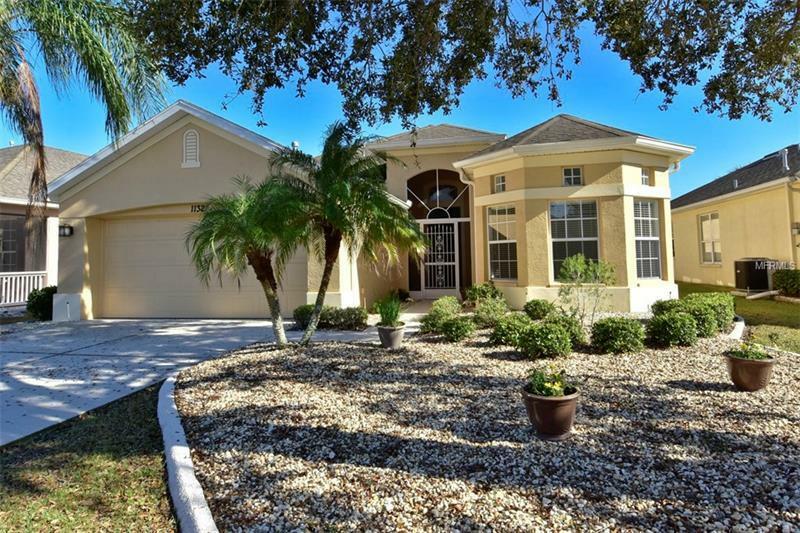 This spacious home is located in a quiet Renaissance neighborhood and sits along a golf course with a peaceful view. Entering through the covered, screened-in front door into the foyer, you are greeted with 10 foot ceilings, neutral tile, carpeted floors and natural light that radiates throughout the open floor plan. The galley kitchen features a pass-thru and an eat-in breakfast nook. The master bedroom suite features a spacious walk-in shower and a garden tub area, walk-in closets with built-in shelving, and a quiet sitting area looking out onto the lush golf course. The split bedroom layout is perfect for all your Northern guests to come and enjoy "instant summer" during the winter. The 2 bedroom, 2 bath model also includes an extra room with french doors for a den or office. In this Renaissance Community, in addition to all the Sun City Center CA facilities, you have exclusive access to the resort styled Renaissance Club. Golf carts are a secondary means of transportation and you can easily access grocery stores, restaurants, doctor offices, banks, Home Improvement & Big"Box" Stores, various Houses of Worship and South Bay Hospital. And, with Tampa, St Petersburg, Sarasota, and Orlando all close by, there is never a shortage of professional sporting and cultural events and family fun with world class beaches throughout the area. Don't forget, the Magic of Disney is only 75 miles away. Buyer pays one time $1800 Capital Funding Fee at Closing to the Sun City Center Community Association.